Professor Funck’s field of expertise is tourism geography, which examines tourism from a geographical viewpoint. Her research is mainly focused on the development of tourist sites, issues related to the development of tourism sites, and sustainable tourism. 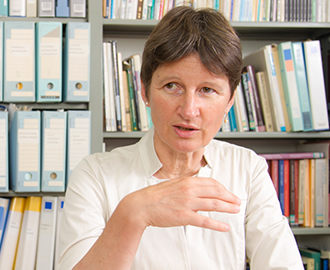 Her main research fields are Japan and Germany. Professor Funck’s research has two focal points. The first is research of the Seto Inland Sea. In particular, this includes research on marine tourism and marine leisure. 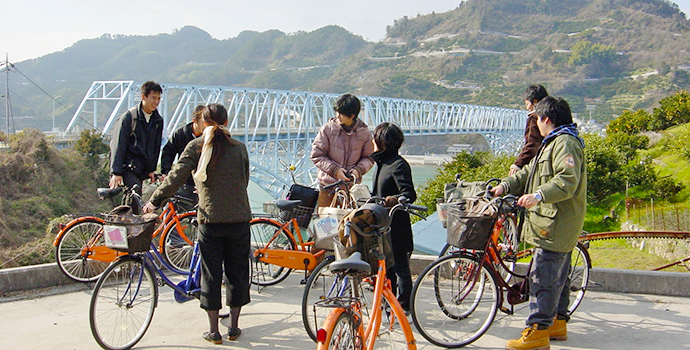 “Despite the fact that the Seto Inland Sea is comparable to the Mediterranean Sea, there is very few development of marine tourism or marine leisure here. One of my main research themes is to examine the reasons for this. I was originally interested in tourism in Japan, and that was the starting point for this research”, she says. The other focal point of Professor Funck’s research is research on tourists from other countries. “Japan started to focus efforts on attracting tourists from other countries from about ten years ago. 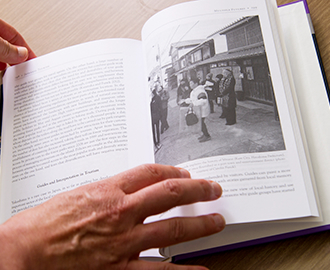 Prior to that, a feature of the Japanese market was that although there were many people traveling overseas, there were few foreigners traveling to Japan. That changed due to the economic growth in neighbouring countries and through the goverment’s policy. Nonetheless, foreign tourists are concentrated in a few areas. I conduct surveys of tourists to identify what kind of issues exist in those areas”. On this subject, Professor Funck has continued to conduct surveys in Hida-Takayama in Gifu Prefecture as well as Miyajima in Hiroshima Prefecture and worked with collegues in Beppu too. She speaks about the real appeal of this research. “Tourism is something that changes drastically, and I find that interesting. It also has two sides, and it’s interesting to look at both of them”. 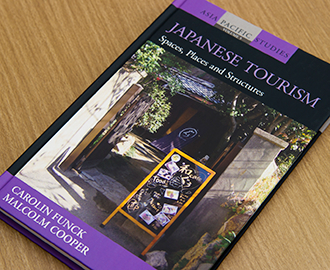 On the other hand, Professor Funck is also critical of tourism policy in Japan. “Japan is suddenly trying to revitalize the economy by putting efforts into tourism, but one should not assume that it is so easy”. She says that one of the aims of her research is to raise awareness of this fact. Looking at disadvantaged regions throughout the world, one can see that there are many areas that are focusing on tourism or aiming at future development through tourism. Professor Funck believes that as tourism is a growth industry, it is extremely important for students to learn about the field of tourism in the Taoyaka Program, where they think about the revitalization of disadvantaged regions. “Tourism has many different characteristics: it changes drastically, it has two sides, it is difficult to link with stable economic activity. Based on that knowledge, I think about how we should address the development of tourism”. 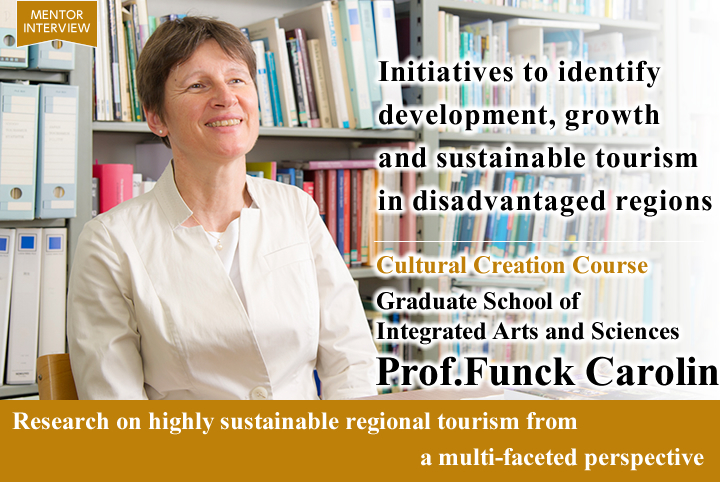 The theme of the subject that Professor Funck teaches is Sustainable Tourism, and for this reason, she says she first thinks about using the indices provided by the World Tourism Organization. “There are many indices that are focused on specific regions, but these have not been used very much in Japan. So one thing I think about is using those indices to evaluate tourism destinations”. Another activity that Professor Funck is planning is collaboration with the Graduate School of Integrated Arts and Sciences’ ‘Twenty-First Century Science Projects’. “For a long time I have been conducting surveys on Yakushima as part of the Study of Culture and Nature in one of the Integrated Arts and Science Projects. It is a world heritage listed location and a tourist area that attracts attention from around the world. So I would like to survey the area and examine sustainability from various different perspectives”. 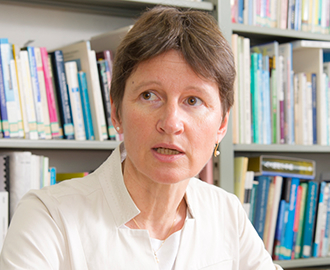 Professor Funck says that she has no doubts about the Taoyaka Program, as geography is originally a field that integrates the humanities with science. Based on that and her experience to date, she speaks about what she hopes for the program. 「“Graduate school is a place where people from various countries come together to learn. So the students not only learn from the teachers, they also learn a lot from each other. I have given a talk about sustainable tourism for a JICA-related activity in the past, and it was the case then too. So in that light, I believe that we are all teachers for one another”. Professor Funck says that what people gain from that experience is a deepening of international understanding. “I want the students to learn that every problem has multiple viewpoints. Not just tourism, but political issues as well. If they can understand that, then I think that they can participate in global activities”. She also says that she hopes the students will involve themselves proactively in their studies and have many questions. “Tourism is particularly an industry of ‘showing’ – countries and regions only show the good aspects. So rather than just looking at those good aspects, I think that it’s important to think more deeply about it, and to have various questions or doubts”. Additionally, in preparation for the onsite education to be held in Japan, Professor Funck says that she would like the international students in particular to attain a certain level of Japanese language ability. “In the onsite portion it will be necessary for the students to speak themselves. I learned most of my Japanese here after coming to Japan. I would definitely like the students to acquire Japanese language skills before the onsite education starts”.